Last year we went to watch the Kalmit Klapprad Races which is held on the first Saturday in September. Kalmit is one of the Pfalzerwald Hills in Rhineland-Palatinate and lies across the Rhine west of Heidelberg (Germany). The Kalmit road up to the hut near the summit climbs 1551 feet in 4 miles 22 chains, i.e. on average 1 in 15 or 7%. In the early nineties of the last century members of the local community organised the first race up to the summit of Kalmit on 1970s Klapprads from the village of Maikammer. The race is now traditionally held on the first Saturday in September (http://www.kalmit-klapprad-cup.de). Over the years the rules have crystallised to allow only single gear Klapprads or Klapptandems. Challenge Cups are awarded for the overall winner, the fastest lady, the oldest oldie, the largest family (Bring the appropriate paperwork! ), the fastest tandem, the fastest youngster and three prizes for the best outfit and the most original folding bike. 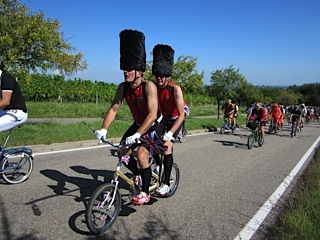 In view of recent royal marriages this year the race was held under the motto "Welcome to the Royal Klapp!” and participants were encouraged to dress accordingly. We felt it was our duty as British Subjects not only to visit the event to report to the far flung corners of the world and, of course to offer technical advice on matters appertaining to flying the Union Flag, clothing, dress and etiquette. We had no desire to see the Bolton Lifeboat called out because someone was flying the flag upside down. It is an ill wind, of course that blows nobody any good and our original plan to visit a folding bike shop in Germersheim before going to watch the Kalmit race were stymied by the late arrival of our tram at Mannheim Central Station, so we were in Neustadt an der Weinstraße much earlier than expected. 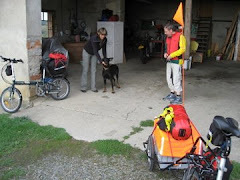 We decided to cycle the four miles to Maikammer rather than take the train. A great idea. The Weinstraße cycle route climbs and drops through the vineyards along the lower slopes of the Pfalzerwald Hills. On arrival we presented our credentials to the race administration but they were not accepted as earnestly as we had hoped. Freed of this role we had more time to observe and photograph. The Klapprads fall into three groups - old and rusty, brought wearing the dust from the back of the garage; the majority that have been polished to improve wind resistance, tuned by sticking go faster tape on the frames and accessorised with teapots, horses’ heads, bouquets, amongst other items; and completely rebuilt with disc brakes, hydraulic forks, new wheels and handlebars where only the frame is original. Which you use is a question of what cup you hope to win. The fastest up the hill are naturally on rebuilt hot rods and with fastest times under nineteen minutes they do not hang about. This area is a stronghold of Karneval, the pre-Lent celebrations when fancy dress is the rule rather than the exception, so Kalmit is another good chance to pop on the mother-in-law’s cast off floral polyester summer frock to cycle five miles. Normally this event is a paradise for cross dressers, but this year because of the British theme, kilt wearers were well to the fore. Large sticky out false ears were removed before the start of the race to reduce wind resistance. The results: Just over three hundred cyclists took part: 264 Kings, 25 Queens and eleven tandems. My dear left turner, the fastest gentleman up the hill took just over nineteen minutes; Lady Eve the fastest lady just under 25 minutes and the fastest tandem piloted by Kate and Pippa 27 minutes 20 seconds and Tail End Charlie just over an hour. A good time was had by all. After the race before the promised party started, weeping with emotion raised by repeated versions of “God save the Queen”, “Auld Lang Syne” and “Land of Hope and Glory”, we made our excuses and left. This year? We missed it I am afraid. The race had a religious theme. We had an invitation to visit a former colleague of mine and wife in Frankfurt on that very day (1 September 2012) to look at their new son. However next year we will be there and if I can find a klapprad in Sperrmüll, I might take part. Course I might feel a need to swim the English Channel first.